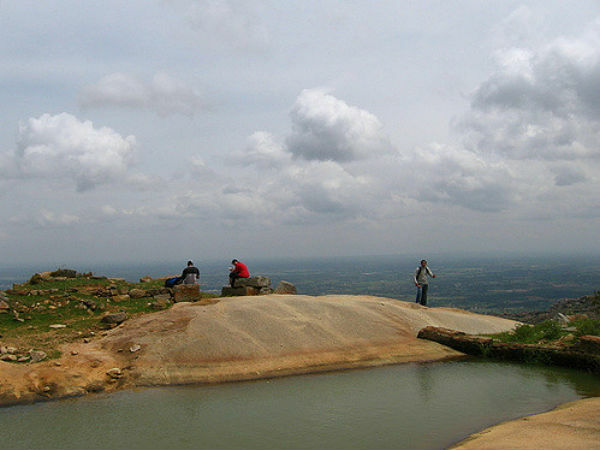 Antargange Hill is one of the popular pilgrim spots in Karnataka. It is located in Kolar, at just 4 kms from Kolar town. Antar-Gange literally means Ganga from Within/Ganga of the deep in Kannada. It is a huge field of boulders and rocks. Located at an altitude of 1712 m above the sea level, the boulders are amassed one on top of the other to appear like a cave. This network of cave formations makes this place famous for cave exploration and easy trekking. Antargange has a long staircase that chaperones to a temple. This temple is dedicated to Lord Kashi Vishweshwara. Dedicated to Lord Shiva, this temple is often called Kashi of South or Dakshin Kashi. The bull, which is considered the vehicle of Lord Shiva has water flowing out of its mouth. Many people have tried to draw out the source of the water, but have failed. The source of the water still remains untraced. This is how Antargange attained its name. Antargange experiences high humidity during summers from March to May. This can prove to be a tad distressing for tourists. Trekking and cave explorations must be avoided in the monsoons because it can get slippery and prove to be dangerous. Monsoons start from June and extend to September. The northeastern monsoons kick off in October and go on till November. December to February is the best time to visit Antargange. Head torch/flash light, trekking shoes, backpack, loaded water bottles, energy bars, rain coat, medicines, jackets, camera, binoculars and toiletries. How To Reach Antargange From Bangalore? By Air: Kempegowda International Airport in Bangalore is the closest airport to Antargange. You will have to hire a taxi or take a bus to reach Antargange from the airport. By Train: There are three trains that ply to Kolar from Bangalore. The average time taken to reach Kolar is 3.5 h. Antargange is a short auto/cab ride away from Kolar. Route 1 - Bangalore-Hoskote-Antargange via NH 75. This covers a distance of 69 km and takes an hour and a half to complete. Route 2 - Bangalore-Hoskote-Malur-Antargange via Malur-Byranahalli road and Malur-Kolar road. This will take you around a longer distance and hence will take 2 h 7 min to complete. The distance is 67.5 km. Naturally, Route 1 is preferred as it not only takes lesser time to reach, but also has better roads. Start from Bangalore and drive towards Hoskote. It is about 27 km and will take you about an hour and a half to reach. Hoskote has strong historic ties. It was founded by Thamme Gowda, according to a copper plate grant dated 1494. It has a large tank, replete with an embankment. Hoskote subsequently fell in the hands of the Bijapur army, Mughal army and finally it was taken over by Hyder Ali in 1761. The fort area has some important temples such as Avimukhteshwara temple, Varadaraja Temple and Vithoba temple. The Avimukhteshwara temple is dedicated to Thamme Gowda. The annual temple fair is held in April or May. Kote Anjaneyaswamy temple in Hoskote, dedicated to Lord Hanuman is more than 800 years old. Drupadamma Karaga is a famous and pompous affair for Vannikula followers. Hoskote is a great place for birdwatchers. The dried up lake bed is now used for parasailing. Shivarapatna, which is 20 km from Hoskote is known for its rich treasure of sculptors and the art of sculpting. A famous temple ascribed to Lord Venkateshwara, Chikkatirupati is about 27 km from Hoskote. At a distance of 42 km, Antargange from Hoskote is about 50 min away. Antargange is famous for cave exploration and night trekking, other than the temple. The caves are in actuality small and big rocks of the mountain that have receded to form caves on the mountain. Some of the caves are exiguous and small, which makes it all the more thrilling to wriggle through them. This only adds to the adventure! It is recommended to wear thick jeans and full sleeved shirt when you set out to explore the caves. More importantly, it is imperative to carry a torchlight - it is indispensable. There is a lot of monkey menace near the caves. It is advised not to carry food articles visibly because of the same reason. The caves can get confusing. Therefore, it is advised not to travel alone. The locals might be wandering near the rocks and it is always a good idea to ask them for help in return for cash. Antargange is not a scenic place in any way. It offers a great experience of night trek and cave exploration is all. The night trek at Antargange is a popular and most sought after one among the trekkers. It is a fantastic experience to lie among the boulders and see the stars. The trek is of moderate difficulty. It is a 3 km trek that takes 2 h to reach the top, if you are fit and prim. There are five tiny hamlets on the way. Once you reach the top, there is a viewpoint from where the entire town of Kolar is visible. You can rest up and wait to catch the sunrise here. It is a magnificent sight to behold. This incredible experience of making your way to the top of the hill is a tale to share. For the night trek, it is advised to take food from Kolar as there are no eating joints in Antargange. Non-vegetarian food must be avoided because it can attract unwanted visitors such as wolves, foxes and snakes. This trek or cave exploration must not be undertaken if one has heart problems, weak joints or is claustrophobic. It requires extensive crawling, jumping and climbing. Therefore, it is advised to prepare for the trek well in advance by consuming a nutritious diet and following an exercise regimen.